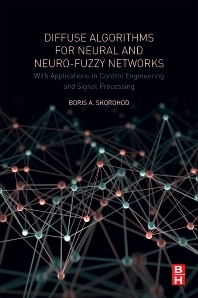 Diffuse Algorithms for Neural and Neuro-Fuzzy Networks: With Applications in Control Engineering and Signal Processing presents new approaches to training neural and neuro-fuzzy networks. This book is divided into six chapters. Chapter 1 consists of plants models reviews, problems statements, and known results that are relevant to the subject matter of this book. Chapter 2 considers the RLS behavior on a finite interval. The theoretical results are illustrated by examples of solving problems of identification, control, and signal processing. Properties of the bias, the matrix of second-order moments and the normalized average squared error of the RLS algorithm on a finite time interval are studied in Chapter 3. Chapter 4 deals with the problem of multilayer neural and neuro-fuzzy networks training with simultaneous estimation of the hidden and output layers parameters. The theoretical results are illustrated with the examples of pattern recognition, identification of nonlinear static, and dynamic plants. Chapter 5 considers the estimation problem of the state and the parameters of the discrete dynamic plants in the absence of a priori statistical information about initial conditions or its incompletion. The Kalman filter and the extended Kalman filter diffuse analogues are obtained. Finally, Chapter 6 provides examples of the use of diffuse algorithms for solving problems in various engineering applications. This book is ideal for researchers and graduate students in control, signal processing, and machine learning. Professor Skorohod was born in Dnepropetrovsk, Soviet Union in 1951. He received M.S. and Ph.D in electrical engineering from Sevastopol State University, Sevastopol, in 1973 and 1980, respectively. From 1980 to 1985, he was a Senior Researcher with the Department of Technical Cybernetics, Sevastopol State University, from 1985 to 1991, he was the Head of the Laboratory, Sevastopol State University and since 1992, he has been professor in the Department of Informatics and control in Technical systems, Sevastopol State University, Sevastopol, Russia. His interests include control systems, intelligent algorithms, neural networks and fuzzy logic.